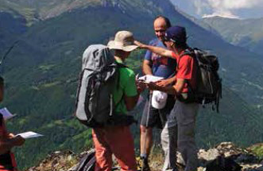 Currently as a part of project 15 candidates for mountain leaders are in proces of training. BALKAN HIKING ADVENTURE (BHA) is a platform for development of mountain tourism in the border area of Macedonia, Kosovo and Albania. The main tourism product contains several components i.e. micro products, which can be used and combined as day or extended hiking tours. The BHA tourism product is a result of the project Sustainable Tourism for Support of Regional Economic Developmentin Structurally Weak Regions.